The humpback whale is known for its loud haunting songs, which can be heard 20 miles away. However, new recordings show mothers and calves "whisper" to each other, seemingly to avoid attracting predators. The quiet grunts and squeaks can be heard only at close range. By calling softly to its mother, the calf is less likely be overheard and preyed on by killer whales, scientists believe. Dr Simone Videsen of Aarhus University in Denmark is part of a team of scientists who tracked eight baby whales and two mothers to learn more about the first months of a humpback whale's life. They used special sound and movement recorders, which were attached to the whale's skin via suction cups. "We were really surprised because humpback whales are really vocal normally and they have these long songs," she said. "But when you look at the communication pattern between mother and calf you see that they're often silent and they do produce these weaker signals." She said it was the first time that communication signals between mother and calf had been recorded in this way. The researchers believe mothers and calves communicate quietly to avoid being overheard by killer whales or male humpback whales who are in search of a mate. Calves must stay close to their mother to feed and grow before they set off on their long annual migration to the food-rich waters of the Antarctic. The nursery grounds of tropical waters are key to their survival. Here, they must feed and build up fat stores to sustain them as they travel 5,000 miles across open water in rough seas. 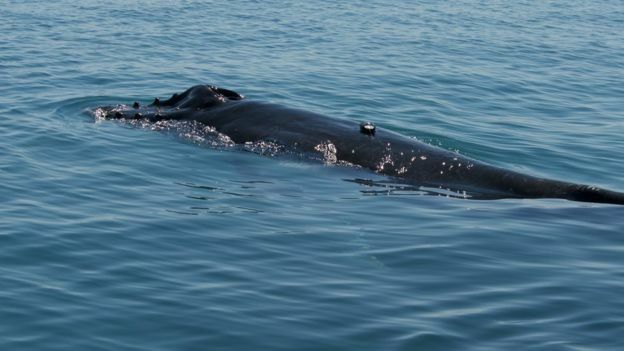 The findings will help in the conservation of this habitat, say the researchers, who studied a population of whales outside Exmouth Gulf off West Australia. "From our research, we have learned that mother-calf pairs are likely to be sensitive to increases in ship noise," said Dr Videsen. "Because mother and calf communicate in whispers, shipping noise could easily mask these quiet calls." There are two major humpback whale populations, one in the northern hemisphere and the other in the south. Both breed in tropical waters and then migrate to the Arctic or Antarctic to feed. Humpback whales are slow to reproduce; pregnancy lasts for 11 months and calves stay with their mothers until they are one-year-old. The research is published in the journal, Functional Ecology.